iOS Simulator can not be used for audio in real time. You must connect an iPhone for testing. 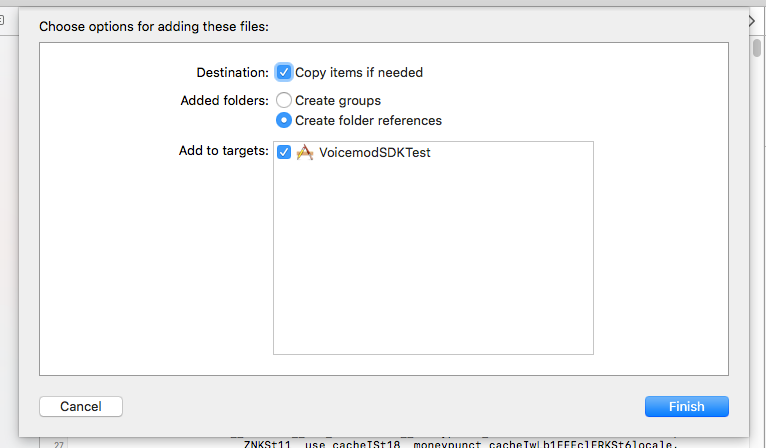 Just drag and drop from the root of the VoicemodSDK folder to your project within Xcode. Just add each of them by going to your main project -> Build Phases -> Link Binary With Libraries and click + for each framework. The are two additions to your actual Info.plist file, a microphone access permission and network access to voicemod.net in order to check your license status. In order to use microphone you need to add NSMicrophoneUsageDescription ("Privacy - Microphone Usage Description" in natural words) string key to your Info.plist file, the value of the key will be showed in alert view asking to the user. Option 1: Add NSAppTransportSecurity ("App Transport Security Settings") key inside your Info.plist file, and add NSAllowsArbitraryLoads ("Allow Arbitrary Loads") boolean key set to YES.